The opening round of the HSBC World Series, the Emirates Dubai Sevens is one of the Jewels in the World Series Crown. There are very few occasions you'll see social Rugby played alongside the Elite level of the game. It has a unique flavour that no other tournament around the world manages to emulate. In last years main event South Africa's Blitz Bokkes took the Dubai Sevens Cup home after a bruising 24-12 win over New Zealand. Beautiful in it's brutality and intensity, seldom do you see a side get so dominated that the game is pretty much over within minutes of it starting. But this was the case the Bokkes were that good. So ahead of this years tournament I wanted to go back and have a quick look at the game, how South Africa dominated the final ,and over the next few articles I’m going to try and outline a couple of key areas in their win and what you can expect from them in this years. The kick off is one of the most important parts of Sevens. As both the chasing and receiving team it’s imperative you get it right. As such it’s somewhat understandable that South Africa put huge emphasis on this part of their game. Over the first three tries of the game we saw a familiar pattern emerge, both illustrating South Africas accuracy and intesnity in execution and the value getting it right offers. a left pod and middle pod (both highlighted) and then a wide unit who are covering the vast majority of the pitch. Offer themselves as a link, taking the wide pass to join up with the wider two man unit. On the other side of the line we can also see that South Africa have a fairly standard kick chase formation. The middle chasers challenge for the ball or hit the receiver man and ball. The outside (far Green Arrow) goes past the ball – incase the ball is spilled/not caught he will be there to regather or challenge the gatherer. The inside chaser (near Green arrow) is generally left with the following decisions: go past the ball on the inside (for the same reasons as the outside chaser) drop in behind the middle chaser for a tap back/spilled ball Defend the missed challenge/missed tackle. A wide defender who will look to work with the 5th man to close down any counter attack. And finally the kicker, who will usually drop into the defensive sweeper position. 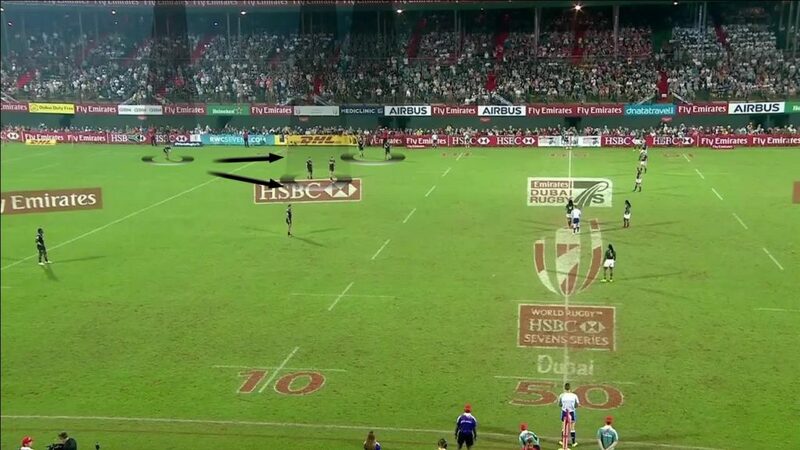 While many teams kick to regather South Africa's kick off strategy, especially late in the tournament when players are tired, tends to be to kick in behind and between the two pods making them turn and go backwards, whilst forcing the sweeper to coming forward. The aim is to cause uncertainty over who’s catching and hopefully force an error. Failing that the Bokkes will hope to narrow their opponents attack (by pulling everyone into a tight space) which will allow their chasers a chance to pressure the receiver and try to force and error or compete for the ball on the ground and tie up the opposition. We can see from the footage it's aperfect kick off, with South Africa dropping the ball exactly in behind the the two pods turning them around. As South Africa doesn’t challenge for the ball Smith instead is able to apply pressure on the catcher meaning New Zealand have to commit to the breakdown in numbers. This ties key New Zealand players in rather than allowing to attack an unset defence. It’s incredibly efficient Sevens from SA, they are able to fill the field with defenders and as New Zealand attack we get a great look at South Africa’s infamously aggressive defence in action. defend the halfback darting to the right of the ruck or step in and help Smith on the pick and go. 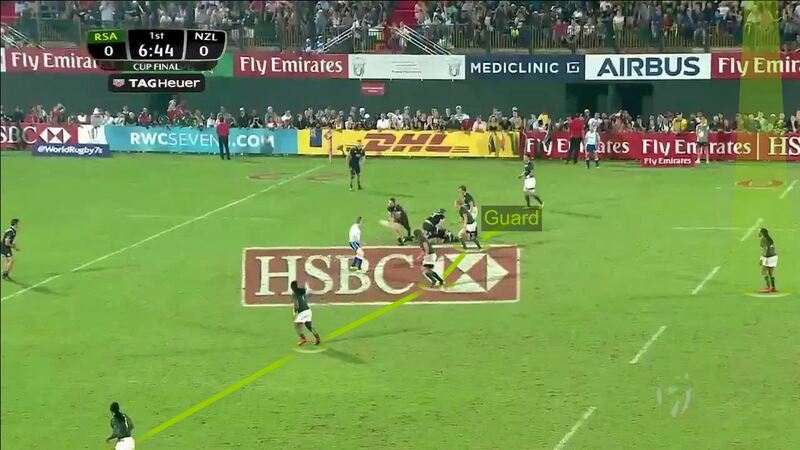 If New Zealand go wide he will push out to help Kok (5) by defending his inside shoulder as he pushes up. 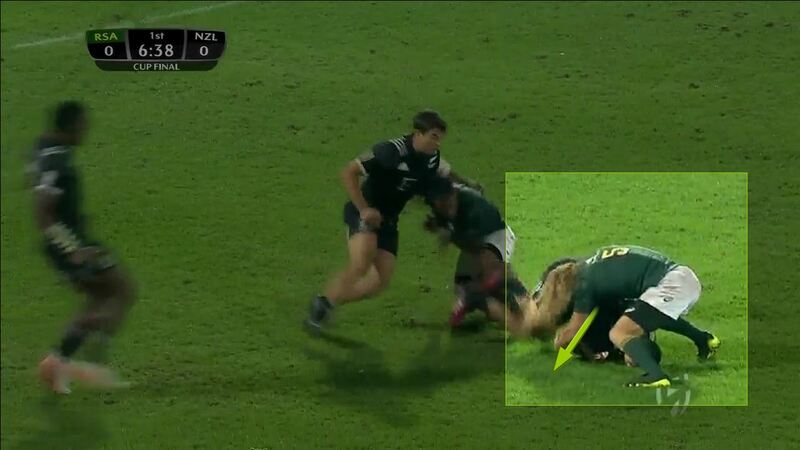 Then in the wider channels we can see the defence is marking man on man targeting inside shoulders. Also important to note is how they haven’t set on the back of the ruck but have given themselves a meter or so to work in. This just gives them that little margin for error around the ruck, should New Zealand snipe they don’t have to retreat and are set for the next phase and is something we'll see repeatedly throughout this match. As the ball comes out South Africa's aggressive defence get off the line very quickly. Staying man on man and eating up the New Zealander's space. It’s poor play from New Zealand who’s inaccurate passing further adds to South Africa’s speed in defence. South Africa shut down the New Zealand attack and it's clear their line speed has driven New Zealand backwards nearly 15 meters. At the breakdown we see intelligent, if possibly illegal, play by Kok who knowing New Zealand favour using the squeeze ball at rucks for ball security, latches on top with his full body weight pinning the player down (again this is something we'll repeatedly see South Africa use throughout this game). Koks weight on top of the tackled player stops the New Zealand player (Ware) releasing and getting back to his feet. Secondly it essentially pins the ball under him stopping him placing it back resulting in Ware being penalised for holding on. 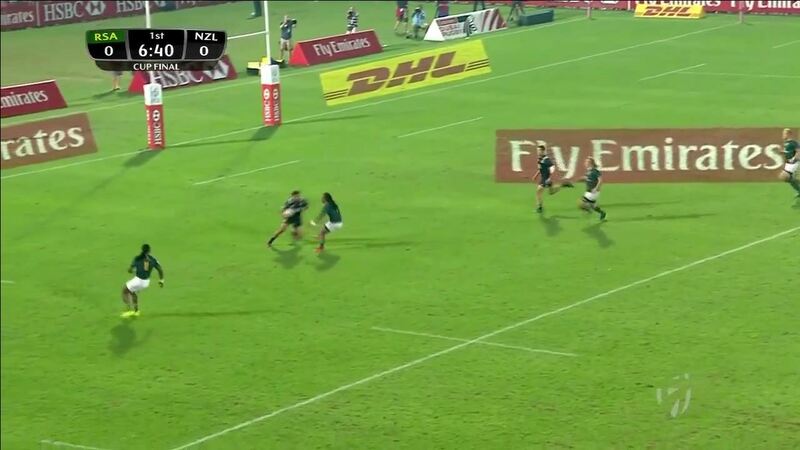 It’s intelligent streetwise play by South Africa, who knowing the margins are much smaller in Sevens continually use New Zealand’s own ball retention tactics against them to draw out the penalty. South Africa go quickly and a panicked Ravouvou comes in trying desperately to close the door and makes a dangerous high tackle. Less than 30 seconds gone and New Zealand are reduced to 6 men and SA have them under extreme pressure. The speed New Zealand coming under pressure is increidble and here the defence sits back trying to buy precious seconds by treading water leaving Ravouvou to become isolated and desperate to make an impact on the Bokkes attack he snaps in and makes a woefully clumsy tackle resulting in his yellow card. It's not a bad read from Ravouvou who see's what's unfolding. The challenge is more clumsy than malicious, but the combination of his team mates jockying off allows South Africa to attack the space and the end result is he turns in late and wildly grabs at Du Preez. While it’s easy to put the Yellow card down to bad luck and of course whilst that plays a part if we track back we can see the outcome is a direct result of South Africa being clinical at each stage of the kick off process. Resulting in relentless pressure and a two New Zealand mistakes. From this penalty South Africa run a one pass wrap style move, which while complicated doesn’t really do much other than drag the defence across the field tracking the ball. Smith realising he’s becoming isolated and that New Zealand have slightly over chased uses his explosive strength to accelerate back and attack that drifting defender powering through to within inches of the line. Dickson desperate to stem the flow comes in from the side and South Africa are again awarded a penalty, from which they tap and go and Snyman crashes over for the try. With 7 players on the park the pressure and pace that South Africa attack at is absolutely relentless, so reduced to 6 you can understand how much New Zealand are up against it. If intensity is a key trait in South Africas play so is consistency and it’s a similar plan of attack with their second try. We see an almost identical Kick off with South Africadropping the ball in the spot. This time Ware is hammered by Dry (1). 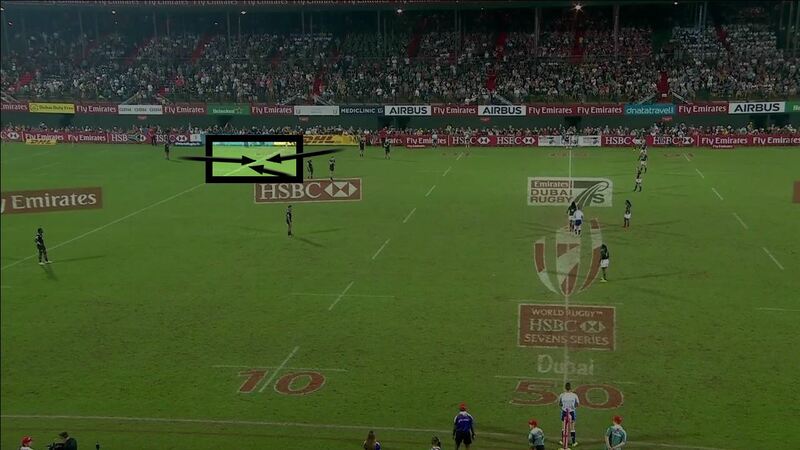 We also get a great example of how quickly the modern Sevens player has to learn and adapt. Notice Smith, like Kok on the previous try again goes to use his full weight to pin Dickson on top of the ball. Dickson sensing the threat reacts quickly, releases the ball and gets to his feet. He then drives over the ball (with some help from Curry) stopping South africa winning the penalty. Kicking when your under pressure and down to men isn’t a bad option in 15's. 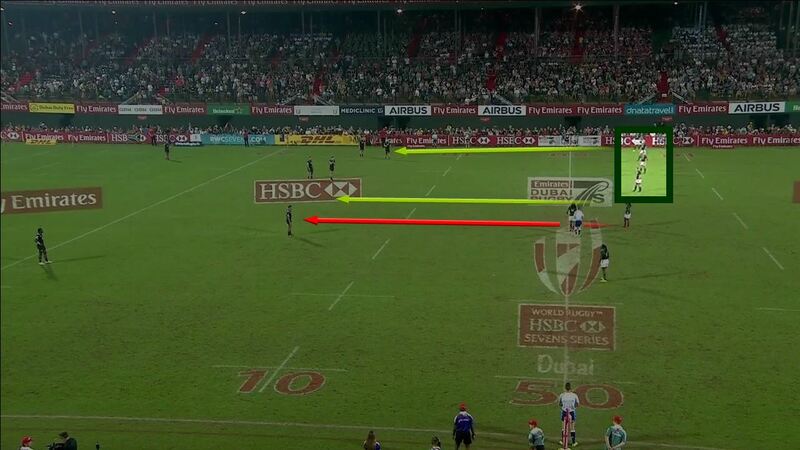 Even in Sevens it can be a useful option when executed right and you get your chase right. 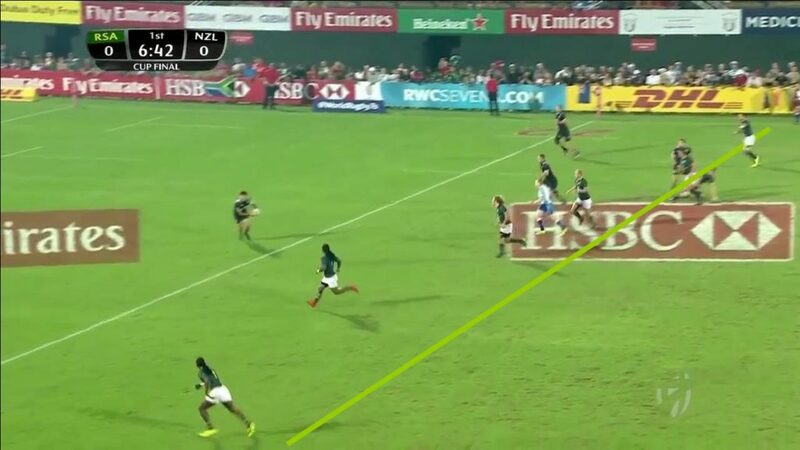 But like all Sevens skills, the margin for error is so small that execution needs to be precise and I think from a New Zealand point of view they would have been better retaining the ball trying to run down the clock on the yellow or kicking the ball long and dead down the left touchline. Unfortunately for New Zealand it's a bit of a kick to nothing and the bounce produces a 50/50 ball which South Africa regather, counter attack with and, when New Zealand get their ruck defence wrong pushing out too early, Kok cuts back into that space, tears through and offloads off the ground for a killer try. With the score at 12-0 South Africa again kick off and unfortunately it’s not third time lucky for New Zealand. Again South Africa execute the same kick off. This time though, back to seven men New Zealand again look to clear down town and Smith charges down and races over to score. So just over 3 minutes gone and South Africa are three scores up. I think it’s a good indication of exactly how ruthless this South African team is. Any chink in the opposition armour is exploited and the pressure their physical and fast approach brings, results in panicked decisions from tired opponents.